PM 992 Parafilm minimizes moisture loss. Used as stopper for laboratory equipment and as covering on irregular surfaces, Parafilm PM992 is available in 2 in. x 250 ft. size. Made of semi-transparent thermoplastic material, product is self-sealing and used in test tubes, beakers, vials, petri dishes and flasks. 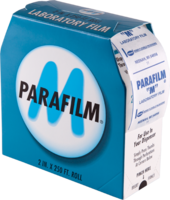 JM Science is now offering Parafilm (PM 992) in order to help meet everyday laboratory needs. For years, Parafilm has been a trusted name in scientific research and laboratory settings. Parafilm is a thermoplastic, self-sealing film that holds moisture loss to a minimum, and can be used as an economical covering or stopper for laboratory equipment such as: test tubes, beakers, vials, petri dishes, flasks and other various instruments and objects that have irregular surfaces. It can also be used as a shelf or tray liner in order to prevent slipping of bottles or instruments. Parafilm is odorless and semi-transparent. We offer size 2” x 250’ at a competitive price. SUNSTREAM® Automatic Boat Covers are designed for boats up to 42 ft in length. Recessed Floor Box Covers hide plugs and receptacles. Blueprint Covers offer water resistance. Temporary Panel Covers provide electrical safety.